To say I was excited about this project is an understatement. 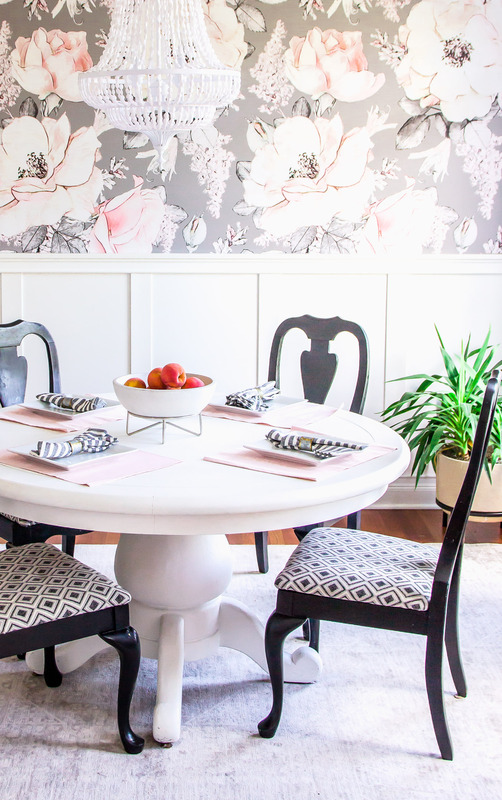 I’ve had “wallpaper our dining room” on our to-do list since we moved in over a year ago (Over a year guys!! Eek!). 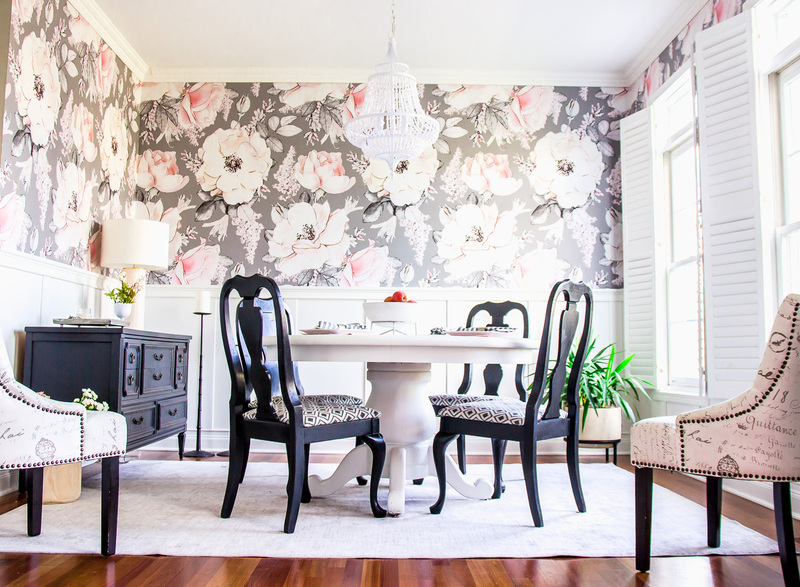 After styling our dining room for our holiday home tour last winter, I knew I wanted a large scale print for the walls. With the board and batten, a large scale print on every wall creates a bold look without being overwhelming. 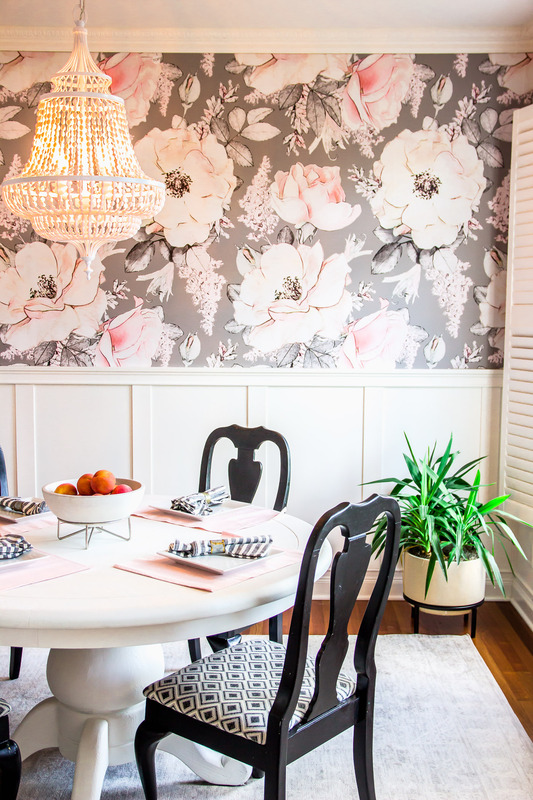 I also happen to LOVE floral prints and statement wallpaper so the Dusty Rose Wallpaper option from Rocky Mountain Decals was a perfect choice! The wallpaper was gifted from Rocky Mountain Decals (thank you!) but all opinions are 100% true! I wouldn’t tackle this project (and the installation!) if I didn’t highly recommend them. 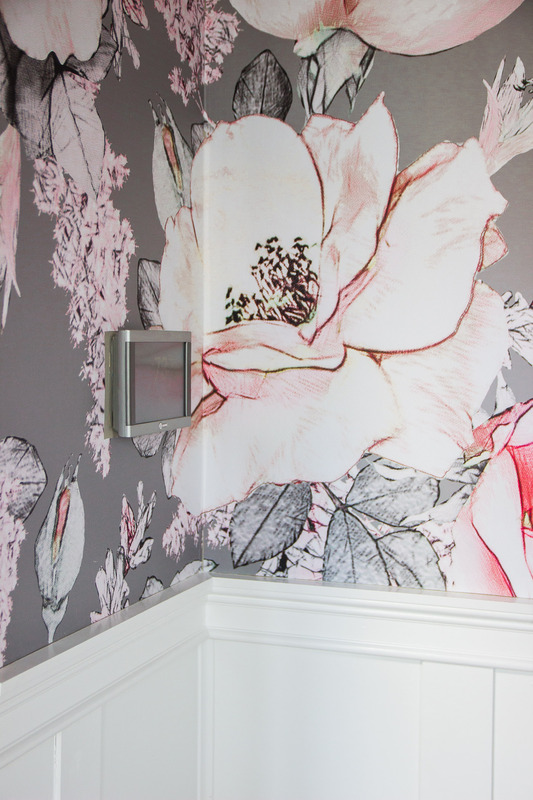 I wrote an entire post about how easy it was to their removable wallpaper in Harper’s nursery in this post. Let me tell you, doing an accent wall is a LOT easier than an entire room. Those corners are no joke! And since I couldn’t wait, I tackled this project by myself. Well, almost. I did have the help of a very eager 4 year old girl. When I design a room for a client, I think about the entire space and how each piece will work together. This includes the wall space and decor. 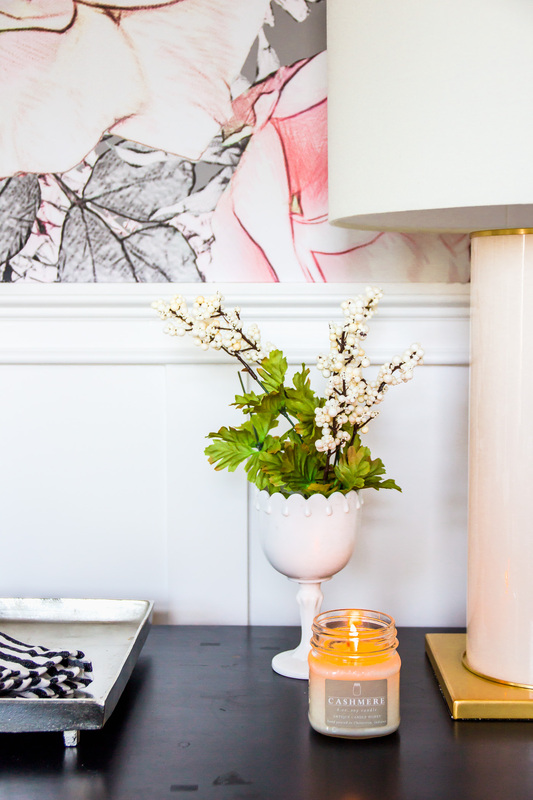 When it comes to my own house, I will admit, I prefer to experiment more and plan less. So, this room is not “done”. It may never really be done, just like most of our house since we’re always rearranging. I still need to figure out what else to put on the walls (thinking a large mirror?) BUT I’ve already planned an entirely different use for this house for the holidays. That’ll be coming up before we know it! 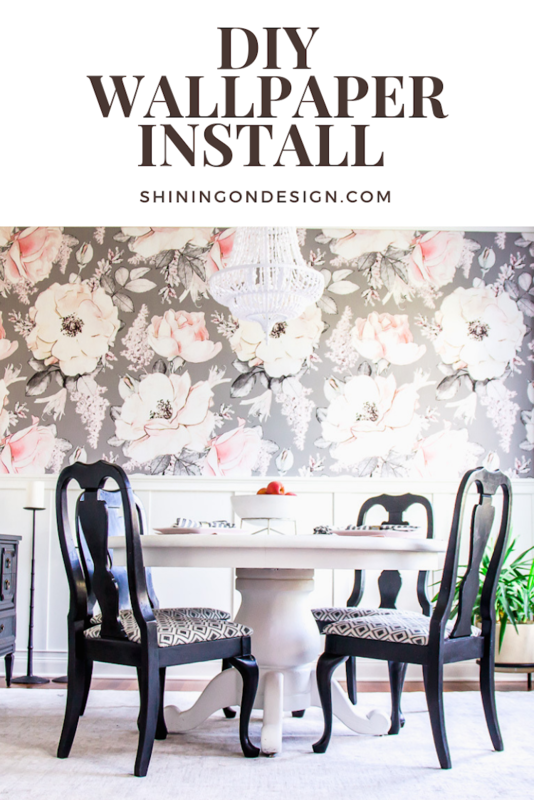 If you’d like the strategy and tips for applying the wallpapering, do read this post where I give the details. How did you apply the wallpaper alone? Full disclosure, it wasn’t easy! I do recommend you enlist a friend to help to make it much easier. It is doable by yourself (or even with a 4 year old helping). I’m not kidding when I say Taylor helped ~ While I held the panel with two hands, she helped pull the backing off. I did do quite a few alone but it makes it a lot easier to have those extra set of hands. It took about a week from start to finish – BUT I promise, you could do it within hours without distractions! Eric was traveling the week we installed it and I have three kids plus client projects so I squeezed in panels whenever I had a chance! You HAD to ask! 😉 Well, he is winning the best husband of the year award. This wouldn’t be his first choice in wallpaper but he knows it makes me and the kids happy. 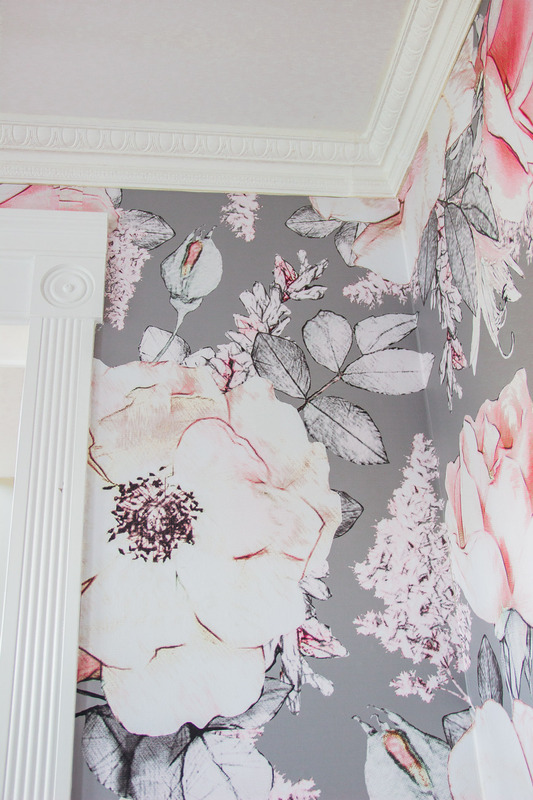 Did I mention how excited the girls are about this wallpaper too?? I installed a few panels while Kinzie (our 2 year old) was at preschool. She came home, her eyes light up and she squealed in her cute toddler voice and said “Mommy, this is so beeautiful”. That made my day. And Eric is content knowing that the wallpaper is removable and won’t ruin our walls when its time to take it down. Wallpapering an entire room and lining up each corner was tricky. Also, things like thermostats sticking out 1.5″ from the wall are HARD. I had wallpapered around outlets before which is nothing compared to this obstacle. With outlets, you just cover and use a straight edge around it (at least thats what we did). With this thermostat, I had to measure so carefully and straight edge the square out before hanging the panel. It would have been so much easier if we could take this thing off but it’s a fancy system that I didn’t want to mess with. Tips to wallpaper by yourself? Patience! And measure carefully. Rocky Mountain Decals will help you determine how many panels you will need for your space if you send them measurements. I always like to double check with the company or a professional installer before ordering wallpaper. 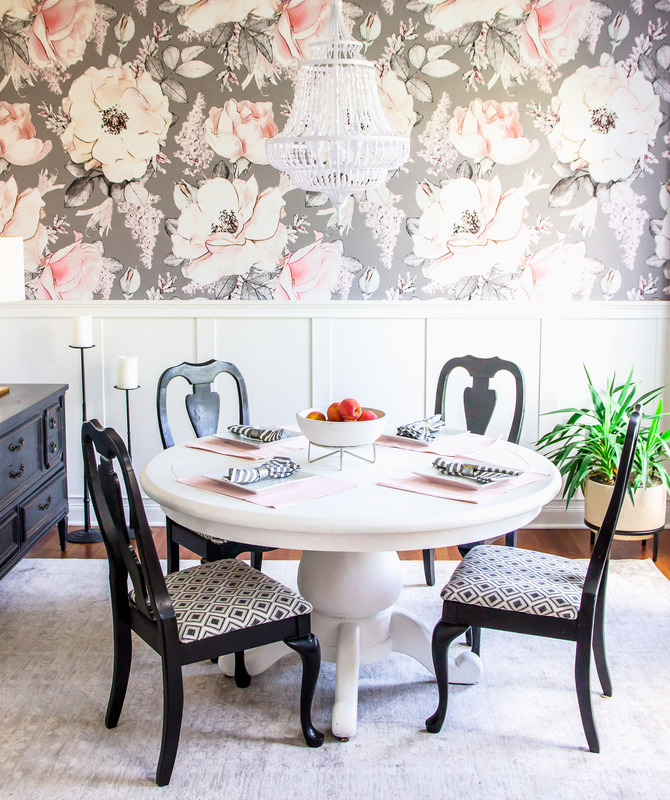 If you want to tackle a wallpaper project by yourself, I definitely would use a wallpaper that is durable and easy to work with. There were plenty of times that I had to peel the wallpaper off and put it back to make sure it would line up properly. This is my current view as I’m typing. And it may be my new favorite view in the house! Good job! 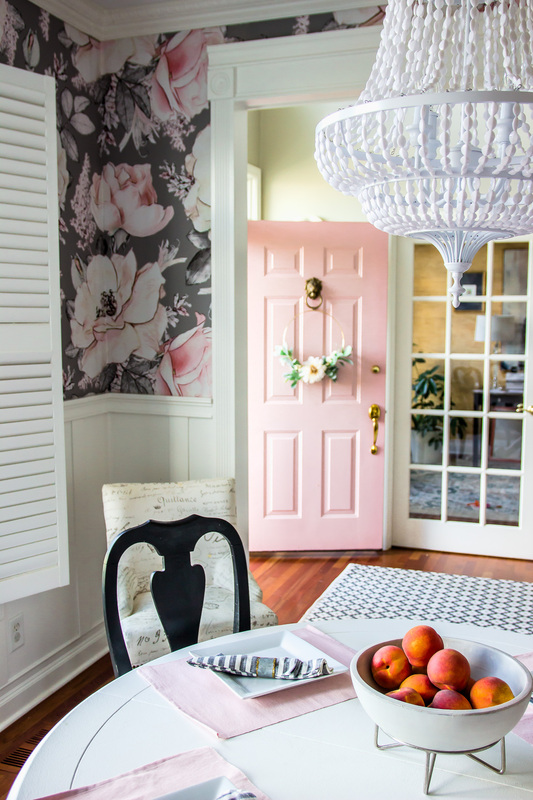 We did just the little nook in our kitchen a few years ago, and it was both my husband and I, and it still was kind of a nightmare, so I can’t even imagine doing it myself! Thank you! It was definitely a little challenging at times but thank goodness the paper was forgiving. I couldn’t imagine tackling a project like this if I couldn’t readjust the panels so many times!